Step 1:- Login in to your Facebook Account. Step 2:- Now select a friend from your online friends list and Click on the middle * button and select Add Friends To Chat option as shown in the figure. Step 3:- Add your friends to whom you want to chat. 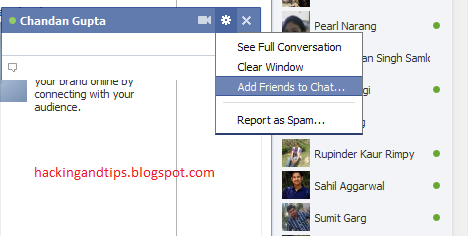 Step 4:- Click Done Button and Start chatting with with your friends.